The local election brought two significant changes that will affect the San Francisco real estate market. First, Measure W passed, significantly raising the transfer tax on residential and commercial properties of $5,000,000 or more, from an additional 12.5% at the low end to 20% at $25,000,000 and above. Second, measure X now requires developers who convert Production, Design & Repair Use, Institutional Community Use, and Arts Activities Use to not only replace the space on a 1:1 basis but also get a conditional use permit from the Planning Department to do so. What this means is that developers can no longer purchase buildings and convert the use to office or residential, even if those uses are allowed for that area, unless they also build back the use they’ve displaced. An unanticipated negative result of the presidential election is that interest rates jumped .25%-.375% higher in just two days. This is only the second time that significant a rise has happened in two days. The immediate effect of this on housing sales is that buyers borrowing capacity just dropped. For example, let’s say someone qualified last week for a $1,000,000 loan at 3.75%. This week, with the higher interest rate, they only qualify for a $956,000 loan. 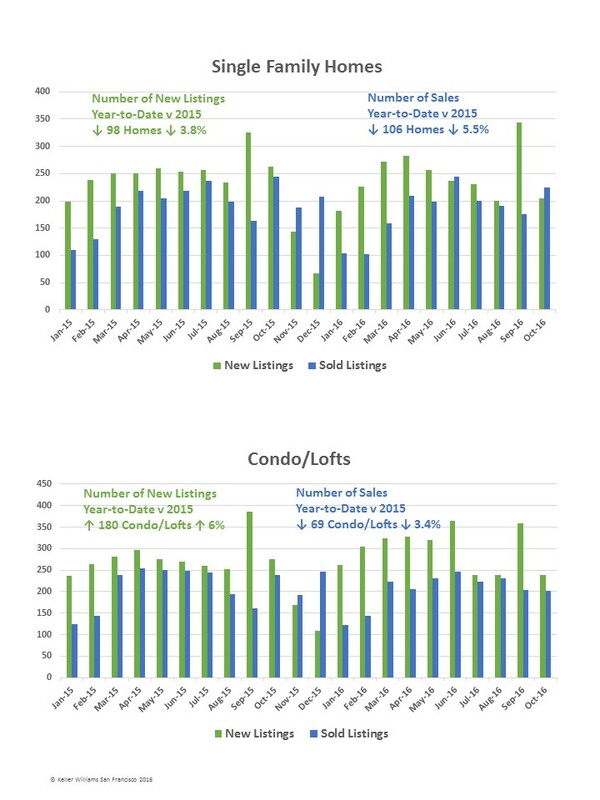 So, buyers can afford less so offers go down, and then sales prices go down. In looking backwards at the sales data, October brought its seasonal home sales boomlet, with the second highest number of single family home sales this year. 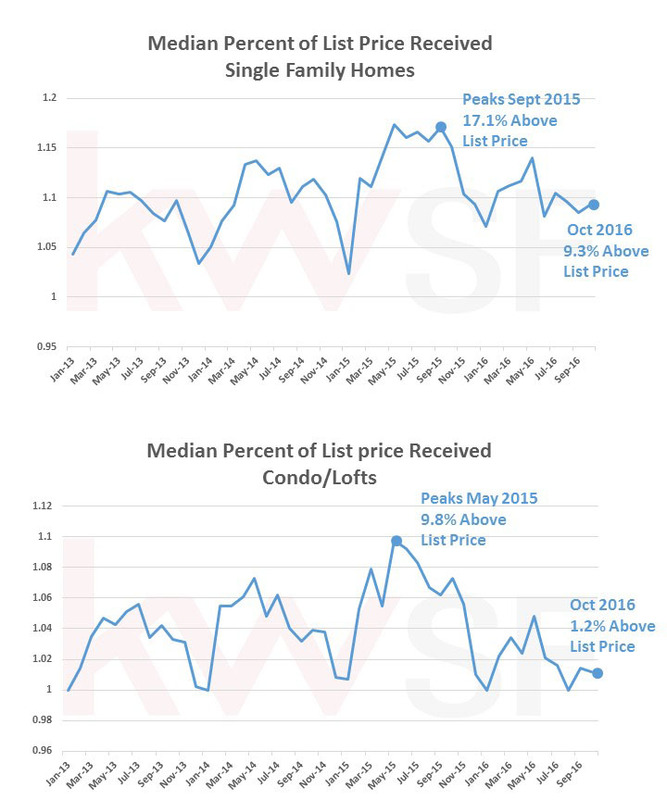 The median price of $1,407,000, 11% higher than last October, and just above May’ 2015’s previous peak of $1,400,000. 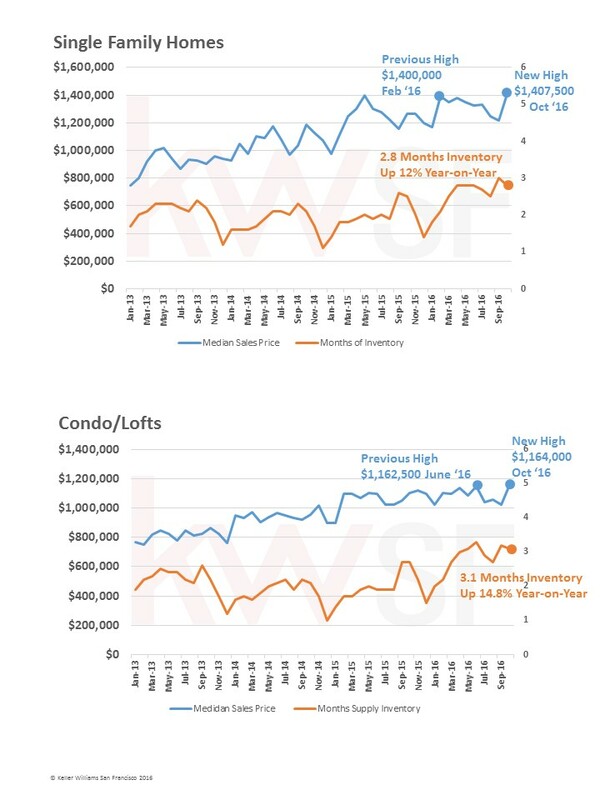 The number of Condos/TIC’s sold was down but the median price popped up to $1,164,000, just above June’s peak of $1,162,500. That’s up 6.3% from October 2015.